Stunning (yet fake!) 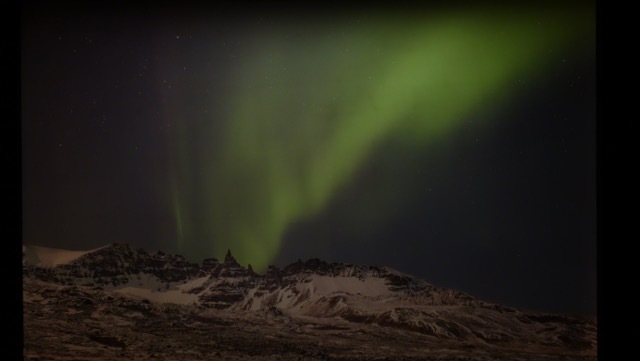 pic taken with some help from the Aurora Reykjavik Center. Iceland may be best known for its glaciers, volcanoes, and, lagoons (and possibly even elves and trolls, too! ), but it’s also a prime spot to witness one truly spectacular phenomenon: the Northern Lights, aka Aurora Borealis. The jaw-dropping display is not always visible to the naked eye, though, so Aurora Reykjavik: The Northern Lights Center, a museum located in the city’s old harbor area, is your next best bet. Here, the simple but fascinating exhibits help explain this otherworldly effect—plus you get free organic tea and coffee! 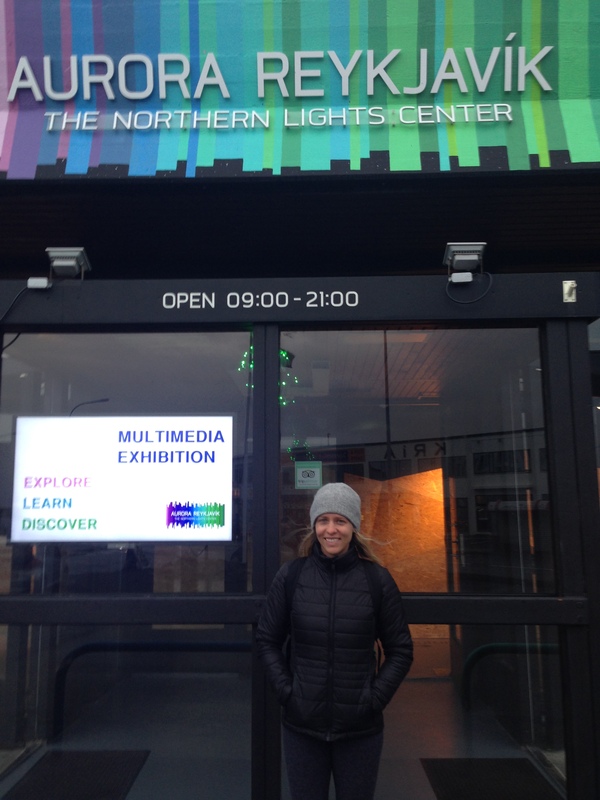 The Center is divided into sections, which include legends around the Northern Lights, interactive and educational displays, visibility forecasting, and a how-to photography lesson. Handstand Steph outside of Aurora Reykjavik. The first part of the Center introduces you to the various myths surrounding the Northern Lights, from Norway to Russia. It makes you realize how humans so often try to explain the unknown in a way that reflects on their own insecurities and emotional frustrations (hint: a lot of the myths revolve around unfaithful lovers and women being seduced). After the exhibits, you’re invited to sit back and take in a continuously running panoramic film of marvelous auroral displays. Be prepared to fall into an enchanting trance. 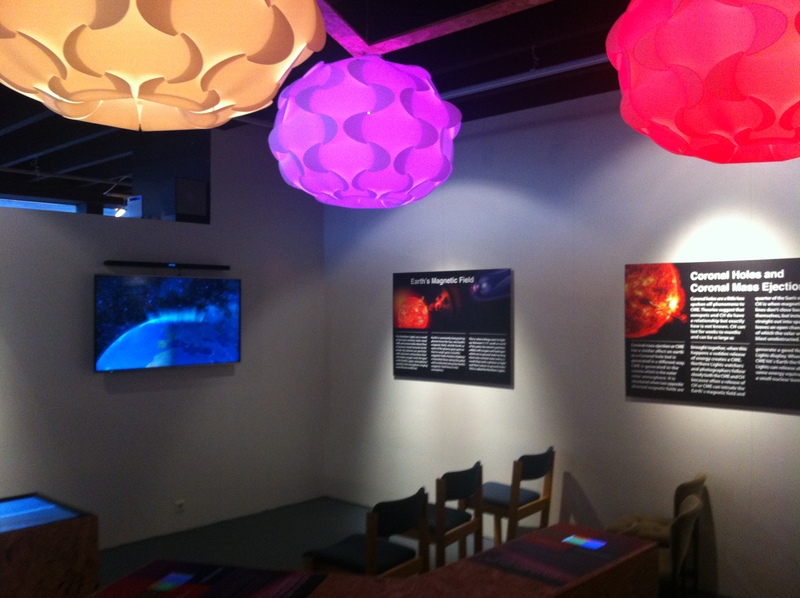 Aurora Center displays describing how solar storms and the sun play into creating the spectacular northern lights. Outside of the free coffee and tea (of course! ), one of the best features at Aurora Reykjavik is saved for the end. Here, you can learn how to adjust your camera’s settings to successfully photograph the Northern Lights. We especially enjoyed the specially equipped “photo booth,” where you can attempt to try your hand at capturing the auroras. Frankly, we learned some new techniques on how to use our new digital camera with Aurora Reykjavik’s tips. Thanks, guys! This is a must-do in Reykjavik. Go visit for some truly fascinating science and mind-blowing visuals.